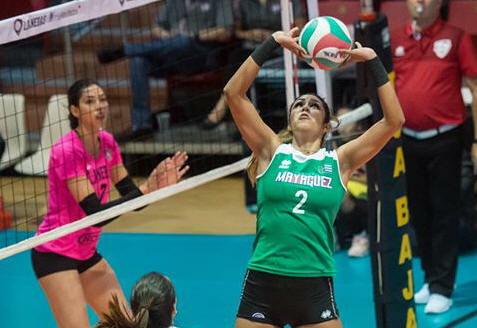 SAN JUAN, Puerto Rico, April 3, 2019 – Kathia Sánchez, the setter of Indias de Mayaguez, had another good week in spreading the ball for her side only that this time she added her best offensive performance to win the honors as Most Valuable Player of Week 10 in the Puerto Rican Women’s Superior League. In two matches during the week, Sánchez had 22 points (8 attacks, 7 blocks and 7 aces) to go with 19 digs and 39 assists. She is also leads the league with 458 assists. Ivonessa García (Juncos) and Paola Rivera (Naranjito), the opposite Aida Bauza (Trujillo Alto) and Xaimara Colón (Juncos) as líbero. The battle for the scoring title continues to be a very close one between Paulina Prieto (442), Andrea Rangel (438) and Karina Ocasio (433). Prieto has a comfortable lead in attacks with 395 while Neira Ortiz dominates in blocks with 80. Rangel is tops in aces with 47. The defensive triple-crown is still under the control of Debora Seilhamer who has 531 defenses and 431 receptions and an effectiveness percentage of 11.29 as libero.